If you stand silently on the mattress of leaf mould, there is plenty to see in the wintry forests of Croatia. Parties of ravens clock noisily overhead, while the bare canopy rings to the piercing scream of a goshawk. A monstrous eagle owl rotates his massive dish face down from the bough of an old oak tree to examine you with insolence. It is easy to be distracted by the abundance of bird life moving easily between these naked twigs, but this is no twitcher’s holiday. Croatia is home to some of the best driven wild boar hunting in Europe, and as the trees begin to echo with the sound of barking dogs and beaters in the distance, the vertical trunks start to crowd in with a sense of claustrophobia. Positioned by a guide half an hour before, he had told me the vague direction from which the boar might come. He had shown me where it would be safe to shoot and he had pointed out where my neighbouring guns were, but nothing he had said could have prepared me for the boar themselves. A very slight crackling betrayed the two pigs as they negotiated a fallen branch, then skirted back onto their chosen route. They weren’t in any hurry, and they bounced along with a decisive, confident shuffle. Glimpses caught between the timber revealed tall, rounded ears that looked soft and mobile, while the bulk of the animals was sown all over with silver guard hairs against a backdrop of charcoal. The leading pig had a ghostly grey mask, with lips curled on either side to reveal tusks like small studs. My impression of the two silent fugitives was made up of dozens of snapshot glimpses as they appeared and then vanished again behind the trees, but when they came into the open just a few feet away, all of the composite parts came together to form a whole. I felt as if someone had just punched me in the stomach. 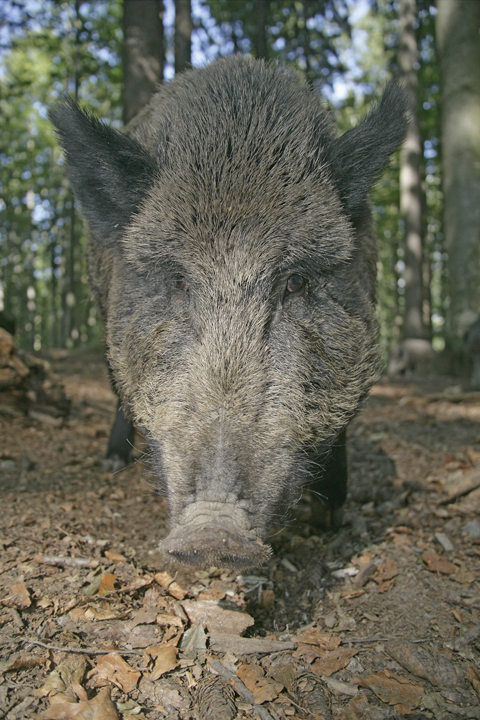 From seemingly docile to suddenly possessed, witnessing the behaviour of boar is one of the attractions of hunting them. The leading pig stopped abruptly. The other snapped to a standstill as if the same mechanism had just switched them both off. Fifteen feet of moist air stood between us. My heart pounded noisily as the pigs recognised the trap. The modest, secretive shapes seemed to unfold into activity, sending up sails of bristles and recoiling hysterically away. In any other situation it would have been a laughable overreaction, but here it set the universe into slow motion. Twisting round onto my left side, the first pig broke instantly into a frenzy of insane exertion. Its head nodded furiously up and down as it ran, and the bulky body that just a second before had seemed sleek and ponderous suddenly became a block of writhing muscle. Only dimly aware of the other pig that shadowed the first, I felt the rifle come up to my shoulder. It was strange to see the red dot sight appear amongst that greasy hair, but the trigger was easy to come by. Impossibly, this mass of meat was covering ground like a sprinter. If I didn’t act very quickly, it would vanish into the trees; already, dull columns of timber were beginning to obscure my view again. The first shot killed the pig, but such is the nature and anatomy of these animals that it hardly acknowledged the impact. The lead seemed to tap it softly on the shoulder, and while it stumbled for a fraction of a second, the recovery was almost instant. On my part, the crashing recoil of the 7mm rem mag felt like little more than a spud gun. Not knowing how hard I had hit home, the second shot was spat out in fractionally longer than it takes to work the bolt and bring the barrel back up again. Having been in slow motion, the pig began to return to normal speed, and although I didn’t register it at the time, it had already begun to trail its heels in the leaves. The second shot hit a little further forward and would have done the job just as well as the first, but still the pig continued to smash through the trees. At almost 50 yards, the third shot sent gouts of wood out from the back of a young beech, spraying the sombre darkness of the forest with shocking white splinters. Still the pig ran, but its back legs had turned to jelly and the top-heavy shape was snaking from side to side, slowing down and losing momentum. Moments after it passed out of sight, I heard a crash and then only the frantic sprinting of the second pig. I had been so transfixed with the task of dropping one of these bristling beasts that it had never even occurred to me to shoot at the other. A beater’s dog has a quick breather before the next drive begins. Sitting squarely down on the mouldy floor with the empty rifle across my lap, I came to terms with what had just happened. In the interests of safety, guns are not allowed to move from their pegs until the drive is over. There would be at least another hour of boar hunting before I could walk back to see what I had done, and so I sat and stared up at the twigs overhead until my fingers stopped fluttering and my heart rate returned to normal. I had just shot my first wild boar. Driven boar hunting has to be the most exciting thing you can do with a rifle – it is a totally engaging mixture of adrenaline, suspense and drama. For British guns, it involves the use of rifles to shoot moving targets, which we find innately exciting because it is such a taboo in our own country. But if our reluctance to shoot rifles at moving targets has its roots in safety, wild boar hunting presents an odd counter-argument. With easily defined arcs of safe fire and an abundance of good backdrops, it never once occurred to me that I was in danger from the other guns. As much as we might find the European habit of wearing brightly coloured construction vests a little incongruous with camouflage and secrecy, I must admit it did make spotting my neighbours very easy through thick woodland. And it didn’t seem to have any effect whatsoever on the boar. Over the course of three days, I fired 22 shots and heard dozens of others echoing sharply through the trees, but none of them raised any question marks over safety. Perhaps it had to do with the fact most of my fellow guns had shot boar many times in the past. 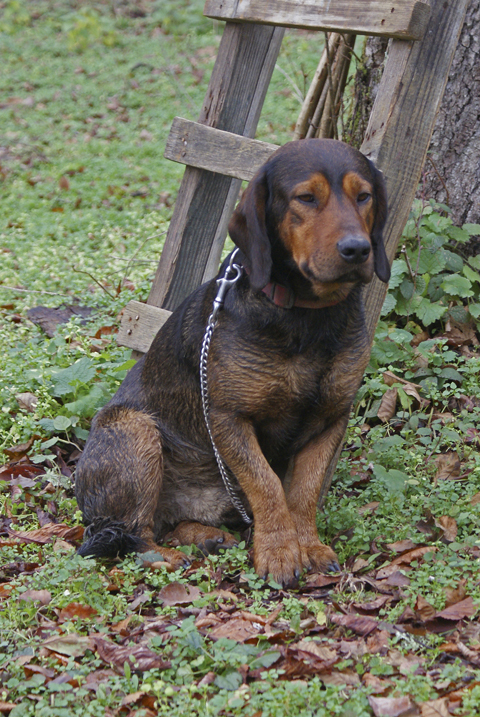 Out of a group of 17 guns, only six of us hadn’t been out with Basswood Sporting Agency before. The main party was made up of British guns from across the south of England, but a small group of Canadians had been enlisted to bring a transatlantic flavour to the occasion. As we landed in Zagreb, there was already excitement building amongst the returning guns, some of whom have carried out an annual pilgrimage to the forests of Croatia for several consecutive years. They knew what to expect, and even before the baggage had come off the carousels I was being plied with tips and advice. The man behind these trips is Frank Ille, a sporting agent with a notable flair for putting British guns in front of Croatian boar. With a cigar clamped between his teeth, he packed us into our minibus and we set off on the final leg of our journey: two-and-a-half hours east to the town of Slatina. 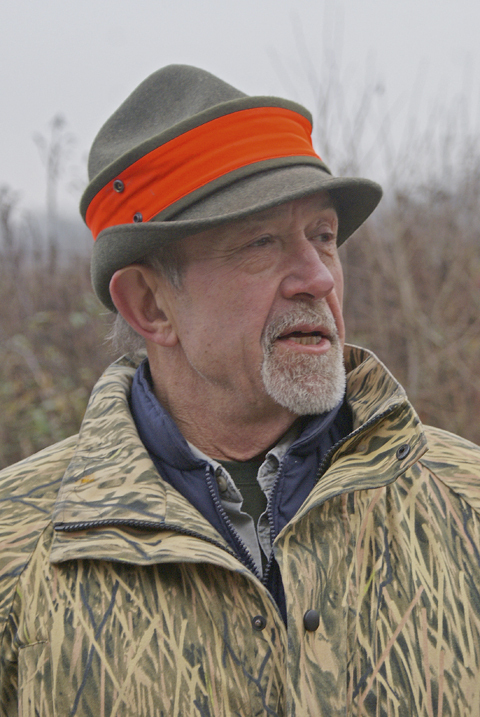 Sporting agent Frank Ille has an honest, passionate approach to boar hunting. It is not a polished, relaxing tourist’s experience but a front row seat for the sport of another culture. There are no fences or enclosures, and the truly wild pigs are given room to be as elusive and as unpredictable as they choose. You might spend a day without seeing one, being taunted by the sound of shooting half a mile away as the pigs cross the line elsewhere. You might lose your concentration for just a split second and then miss your chance at a boar that looks more like a minibus than a wild animal. A usual trip consists of three days of driven boar hunting, and the days are let directly from Croatian shooting syndicates. This is Frank’s genius as an agent: using his intimate knowledge of the land and people, he can dig out the best hunting clubs and concessions, negotiating eye-poppingly good sport for his clients where other agents would certainly struggle. During my trip in early December, we built a bag of 27 pigs. Although we were advised not to shoot foxes a few of us did, either out of sport or habit. The Croatians cheerily tutted these transgressions, not because we had broken the rules but because surely it’s a waste of bullets when there are pigs around? As Frank explains, nothing is guaranteed when you go after wild game, so while some guns shot several boar during the trip, others did not even fire a shot. It was telling that the guns who came home empty-handed were already planning their trip back next year, undaunted by their misfortune and addicted to the experience. You don’t visit Croatia to shoot pigs; you visit for the chance to shoot pigs. 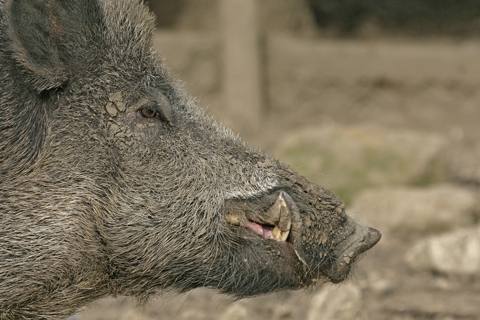 The boar’s tusks, like small studs, are revealed whenever it curls its mouth. As it turned out, four of our pigs were large boar (known in Croatian as vepar) and two of those were big enough to have their tusks extracted. By sheer good fortune, one of the tuskers was mine, but the curving ivory daggers now hanging from my wall are not a trophy but a reminder. Big boar are not rare in Croatia, and they appear frequently enough to keep things interesting. There is a system of measuring boar tusks so they can be awarded medals in the same way we classify deer antlers in Britain, but from my perspective this seemed to be an irrelevance. For me, the experience had nothing to do with medals and measurements and everything to do with the spirit of the occasion. A partial glimpse at a train of wild pigs ploughing across a silent winter ride is an unforgettable sight that seems to fly in the face of sober measurement and trophy hunting. In the same way, casting off the science of long range rifle shooting allows for a much more primal, thrilling reaction as your rifle becomes a short range shotgun. You naturally gauge the speed of the pig, imagining it is a 20-stone woodcock. If you see a big boar and manage to knock it over then congratulations are in order, but having shot little and large pigs, I can’t honestly say the big boar was any more exciting or hair raising than the yearling sow. They presented totally different shots in vastly different circumstances, and they contributed more to a single thrilling experience than individual moments in themselves. It so happens that clients who shoot with Basswood pay a flat rate for all boar shot during the drives, with no extra trophy fees for boar that turn out to be larger than average. In this environment, trophy hunting comes in a distant second to the experience itself.